Yes, this is holy music. Ware and company play to get in touch with inner divinations in a way analogous to the manner in which some people pray to find the god within themselves. While that might seem silly, words themselves seem unable to capture the spirit of free jazz or to describe the sound of the music, especially when performed by such a master as tenor saxophonist David S. Ware and his combo. Using traditional music vocabulary makes discussing free jazz seem like one is analyzing chamber music or something more stiff and decorous. Phrases like the “intricate interplay of instruments” and “long vibrato arpeggios and glissandos” do not properly convey the feelings expressed. On the other hand, saying things like “long improvisatory solos” and “extemporizes in tandem” overlooks the formal and ceremonial elements of Ware’s work. He is a composer and these are crafted compositions. 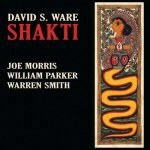 The songs on Shakti were written especially for this ensemble: Joe Morris on guitar, William Parker on bass, and Warren Smith on drums and percussion. The band members take extended solos as well as work in combination to create sublime, sprawling melodies whose lines cross at odd angles and juxtapositions. The instrumentalists create with an insistent intensity as they journey to the singular aim of transcendence. The music comes across as imminent and immanent. Yes, this is holy music, as suggested by the name of the title cut. Shakti is the Hindu term that can be loosely defined as the divine, creative cosmic force that occurs when a being is at one with the entire universe. Ware and company play to get in touch with these inner divinations in a way analogous to the manner in which some people pray to find the god within themselves. While only the band members can attest to their spiritual success, the music here artfully transports listeners to a higher plane. The musicians freely experiment, most notably on “Namah”. The title comes from one of the holiest prayers or mantras. On this cut, Ware puts down his saxophone to play kalimba and Morris puts away his guitar to perform on drums. The result is oddly reminiscent of King Crimson’s fusion classic “Starless and Bible Black” with its quiet African sounds and dark, poetic overtones. At eight minutes-plus, “Namah” is the shortest track, but in its own way packs as powerful a punch as “Nataraj”, an 18-minute plus exploration into the dance that celebrates the concept of destroying one world in order to create a new one. The performers offer long solos here and offer personal meditations on their instruments. The results express their strong emotional desires for a better life, in the spiritual sense. The “spontaneous overflow of powerful feelings” expressed in the music on this disc recall the words of the English poet William Wordsworth. Indeed, these songs work best when “The world is too much with us.” Our material existence can blind us from the stronger, natural forces that exist within and around us. Shakti operates as a call to remind people of their deeper essences.